WARSAW — A daughter who not only failed to return her mother’s vehicle, but also stole a television and jewelry from her mother’s home, has been arrested. 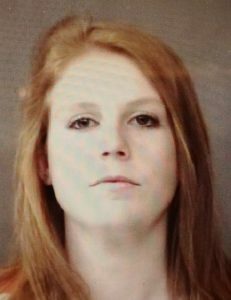 Chloe Blaze Gosnell, 19, with addresses of 13990 N. 300E, Syracuse, and 3107 Kuder Lane, Warsaw, has been charged with auto theft, a level 6 felony. She was arrested Wednesday afternoon, and is being held on $5,250 surety and cash bond. Warsaw Police were notified Dec. 17, 2017, regarding an automobile theft and theft of items belonging to Sharon Edwards. Edwards told police she went to Rushville Dec. 9 to make funeral arrangements for her mother and needed to come back to her home to get some items. Gosnell, her daughter, offered to return to her home and retrieve the items and bring them to Rushville Dec. 10. Edwards agreed and allowed Gosnell to use a 2005 Ford Taurus to go to her residence. She also provided keys to the apartment to obtain the items needed. The agreement was Gosnell was to return with the items and vehicle Dec. 10. As of Dec. 17, Gosnell had not returned the vehicle as agreed, nor had made contact with her mother. Edwards also told police when she arrived home she found her 55-inch television was missing and some jewelry had been stolen. The items were valued at $1,500. Nappanee Police recovered the vehicle Dec. 27 and police found the television had been pawned at a pawn shop by another individual.